Arsenal News 12 July 2012 | "It's all about the Arsenal"
Arsenal have been back in training for two days… Some noticeable absentees such as Wilshere, the players that were on duty in the Euro’s. Not sure Alex Song was at training and RVP is on holiday in Spain. 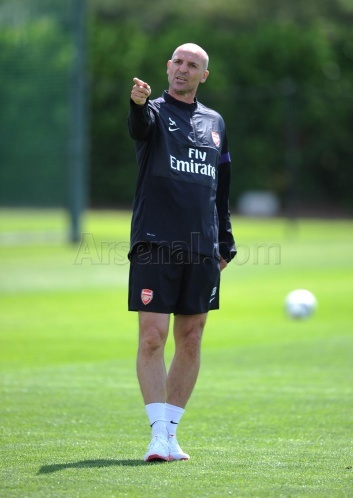 Nice to see Stevie Bould in the pictures starting his No.2 job and hopefully putting what I think are very good defenders at AFC into some shape that they play more as a unit and cut down on those 49 goals conceded last season. Djourou looks to be sporting a dodgy barnet, Abou Diaby is back and should be careful lifting weights’ as we don’t want him to put his back out, do we?. Pardon me also for thinking that in those pictures on Arsenal.com, here and here Carl Jenkinson does not look like a footballer. Love the pictures of Santos, always smiling. One of my favourite players at the club. Still no news on RVP as to will he go, or will he stay? RVP is currently sunning it in Spain… Some suggestion on SSN that he might do a Coalition (that’s a u-turn if you were unsure), though more likely to do with they have sod all to fill a 24/7 news channel. No news either on any new signing, save the usual stack of rumours and I don’t do rumours, well except for the superb Cocktail bar that used to be in Covent Garden. Bloody typical reporting that today it is said that RVP and AW want a quick resolution to this transfer wrangle. Well why then could they have not settled it last summer, or even weeks ago at the end of the season?? Come on AFC/RVP get your fingers out and sort the mess out. If RVP has to/wants to go, sell him and use the money wisely to get someone else in. I think it’s the boots that let the kit down. Though it must be said the guys look well happy in this photo… Smile please!!! Finally and late breaking news.. Today AC Milan sold Zlatan Ibrahimovic & Thiago Silva (£51m). Liverpool FC brought Jordan Henderson & Andy Carroll (£55m). Just who looks after the money at Anfield and surely he is not still working there. Anyway enough for now, work beckons..
the pic don’t look real for me have you extracted them from FIFA 12? Yeah got them both off internet.